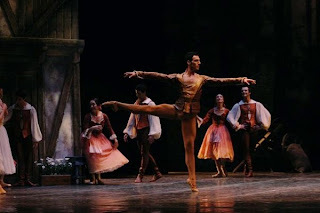 Colorado Ballet is starting a new dancer Q&A part of its blog. The first Q&A is with our new Soloist, Domenico Luciano. Where did you train/dance before coming to Colorado Ballet? I trained at the Real Teatro di San Carlo Ballet School in Naples, Italy. I danced throughout Europe and Italy before coming to the States in 2004 to join Tulsa Ballet and then Dominic Walsh Dance Theater in 2005. What did you do with your summer break? I usually guest with other companies, teach and go visit my family in Italy for a little vacation by the gulf of Napoli. What age did you first start dancing? Pretty late, I was 14 years old. What was your first ballet you remember attending? What do you remember about it? The first ballet I attended was GISELLE with Etoile Alessandra Ferri in the leading role, and Johann Cobborg from Royal Ballet as Albrecht. I was captivated and transported by the magic of the performance. I didn't want it to end. As student of the ballet school, I was able to go every night for more. Who are your ballet role models? Dancers that inspire you. I like dancers that are brave and courageous, want to be challenged and explore all the different style of dance out there. I love all the projects that Wendy Whelan is working on right now. It shows how, as an artist, you never stop learning and growing. After a long and successful career as a Principal Dancer with NYCB, she is diving into new territory, like modern and contemporary dance, with a joy and excitement. It is what Mikhail Baryshnikov and Sylvie Guillem have done as well. At this moment, my male ballet role model is David Hallberg. I think he has a very special presence on stage, besides an amazing technique and quality of movement. Proudest moment in your ballet career? Dancing the leading role in John Cranko's ONEGIN, feeling very connected to the role and getting emotional on stage. Favorite ballets to dance? Which are your favorite to watch? I never get tired of listening and watching Swan Lake. I would love to dance Petit Mort by Jiri Kylian. If you could never dance again, what would you want your final role to be? It is hard to pick one. I definitively would want to dance a role that could give me the chance to share with the audience something special that would be remembered. What do you like to do when you aren’t dancing (your free time)? I'm new to Colorado, so I have a lot to explore in Denver and around! Do you have any pre-performance routines/rituals? Timing is key for me. I like to have everything planned ahead before curtain is up. Maybe I sound a bit OCD…. Oh well, if it all helps. What production(s) are you most excited about this year? This is my first year with Colorado Ballet, it is all exciting to me!!! What would you say to people who come to see the Colorado Ballet? Come and see Colorado Ballet, it is a Company that has a great combination of athleticism and classicism. Colorado Ballet maintains the beautiful and historical tradition of classical ballet delivered by powerful bodies that have a deep knowledge and respect for the craft. 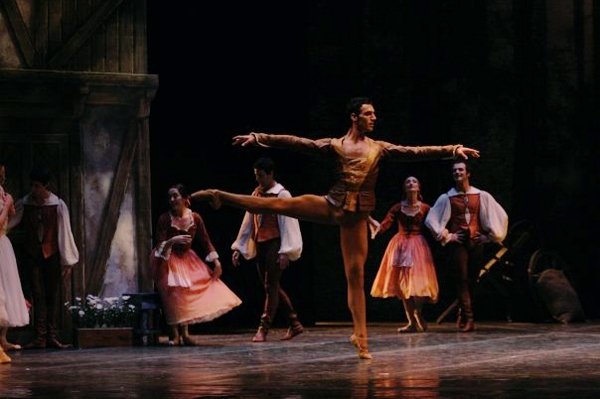 Domenico Luciano as Albrecht in "Giselle"